Check the feel and look of the material as well as the colour shade before you buy, by ordering a free sample online. Where do I use my Blinds Direct Online voucher code? Discover a huge array of Venetian blinds in a variety of styles and colours including metallic, cosmopolitan, aliwood, perforated, cream, grey, brown, black and many more. You can also find vertical blinds and blackout vertical blinds in fire retardant, non-fire retardant and patterned ASC styles. As well as this there’s also roller and blackout roller blinds in grey and cream, plus a wide variety of other colours too. If you’re planning on fitting your blinds yourself you can find all the information you need in the measure and fittings guide section. Here you can find guides on how to fit all kinds of blinds including Venetian, vertical and roller blinds as well as measure guides for the perfect fit. Blinds Direct Online also has a great blog section where you can find tons of articles on all things blinds and home. Discover posts on the commonly forgotten benefits of blinds, how to update your home decor on a budget, the best yearly colour pallets, top interior design trends to look out for and much more. Venetian blinds are a smart and stylish choice for any room in your home. 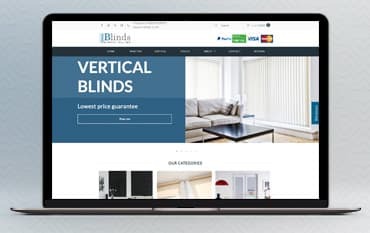 With an easy-to-use tilt mechanism and a variety of different colours and finishes available you’ll love the wide range of Venetian blinds on offer at Blinds Direct Online, all of which are fully made to measure to your exact specifications. From wood-effect to metallic finishes, you can find a huge array of Venetian blinds that match your decor. And all of the made to measure window blinds available come with matching top and bottom rails for a consistent style as well as universal wall fixings that can be easily adapted for top or face installation. Vertical blinds are a great favourite for homes and businesses, offering both warmth/colour and great light control. Vertical blinds also provide a terrific collection of fabrics supplied with a high quality white slimline head track that is incredibly durable and fully made to measure to your exact specifications. With the option of face or top fix brackets and a mono control wand rather than cords, you can have added peace of mind that all the vertical blinds from Blinds Direct Online conform to UK standards for safety and performance. Blinds Direct Online is a well established UK based company who specialise in made to fit luxury blinds for your home or workplace. With a huge selection of Venetian, vertical and roller blinds that are extremely high quality and affordable, you are sure to find the perfect blinds for your house or office without paying too much. Pair your low-cost blinds with a discount code from us and you can save a fortune on your blind order, and with great 5* reviews from a huge array of customers, you can rest assured that your blinds are of the best standard from a company you can trust.